For some time now I've noticed that my body is not as resilient as it used to be. During college I could get by with minimal sleep while eating junk food, but I can no longer pull that off without suffering the consequences. When I get injured, I also take longer to heal than I used to. The aging process creeps up on all of us. Some people seem to age gracefully while others are not so fortunate. 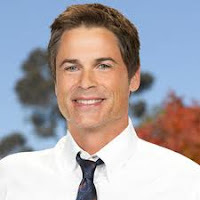 Rob Lowe plays a health and fitness enthusiast in the series Parks and Recreation, and they did a good job casting him, since he is almost 50, yet he looks like he could be in his thirties. I don't know if his secret is healthy living or cosmetic surgery, but he seems to have aged well. As I've been thinking about the inevitable aging process and trying to identify what people can do to slow it down, the easiest thing we can do is to identify those things that accelerate the aging process and make sure we are not doing them. Here are some of the biggest factors that affect how we age. 1) Genetics- Some people will just look younger than others as a result of their genetics. I've seen some high school students who looked like they were in their 20's and some adults who could pass as teenagers. There is not much you can do about genetics, so I'm not going to go into detail here, but just acknowledge it. 2) Disease- Being sick with a disease or illness can take a big toll on your body and can accelerate the aging process. People may be predisposed to disease, but so many diseases are caused as a result of our lifestyle. That is why prevention and developing healthy habits are so important. 3) Stress- There is good stress and bad stress. We all experience varying degrees of stress, but any time someone is under constant stress over a long period of time, it will negative impact their body and wear them down. 4) Smoking- Smoking speeds up aging. The hands and face of a smoker suffer from exposure to the heat, smoke, and toxins. 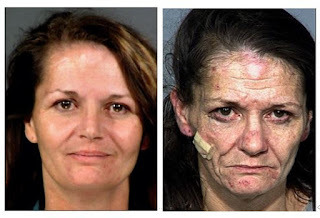 5) Alcohol and drug use- I'm sure you've seen what drugs can do to a person over just a few short years as the attached photos show. I've never seen anything speed up aging as quickly as meth does. 6) Excessive sun / tanning- A tan can look nice on many people, but apparently some people think the more the better and end up looking like a baseball mitt. Sunshine is good for you, but overdoing it can make you look much older than you are. 7) Lack of sleep- Your body will be under increased stress if you do not provide it sufficient time to rest, renew, and recuperate. 8) Poor Nutrition- Many of us eat too many high-calorie and highly processed foods that are rich in sugar and sodium but lack actual nutrients. A diet rich in nutrients, antioxidants, vitamins, and minerals can keep you from looking old prematurely. 9) Pollutants- It's possible to be exposed to toxins in the air, water, our environment, and even the food we eat. 10) Lack of exercise- People who don't exercise are more likely to have problems with strength, flexibility, and endurance. The phrase "use it or lose it" is very true when it comes to physical activity and exercise. The more of these areas you struggle with the more likely you are to age your body faster.You can see that a big part of the solution is healthy living. In addition to the items mentioned above, it's my personal opinion that the following things also help someone look and feel younger. It's also important not to put too much emphasis on appearance. Some people with gray hair and wrinkles are more energetic and vibrant than their younger peers. There may be no fountain of youth or way to stop aging, but if you are living a healthy life, you will fair much better when it comes to the aging process. I'd encourage you to identify the things you are doing that make you feel old, then work at changing those habits.